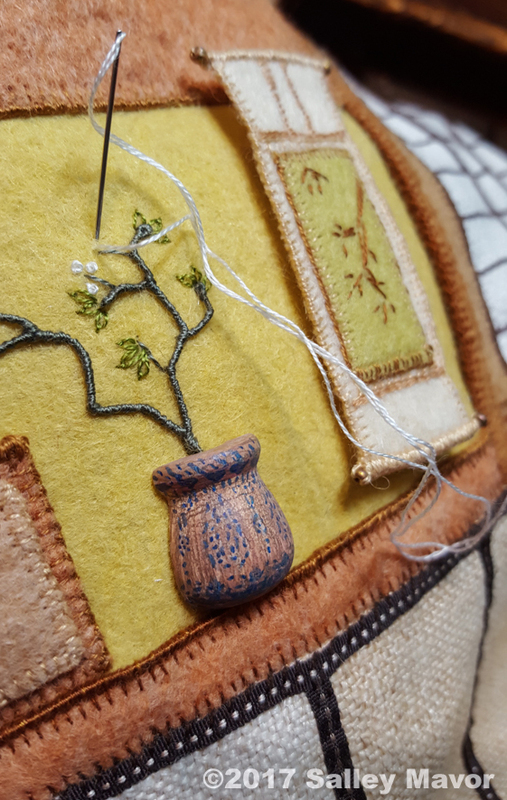 Today, I’d like to give a little behind-the-scenes peek at a recently completed scene for My Bed. Over the next year, I will continue to work on illustrations for the book, which will feature sleeping places in different cultures around the world. Here are links to posts about other illustrations for the book: South America, Russia, North Africa, North America, Holland, India, Iran and Afghanistan. To see a list of all my books, click here. This double page spread has children sleeping on futons in a traditional Japanese interior. To represent a spare and ordered Japanese aesthetic, I deviated from my usual style, which tends to be busy and curvy. I can’t remember the last time I made so many straight lines and right angles! 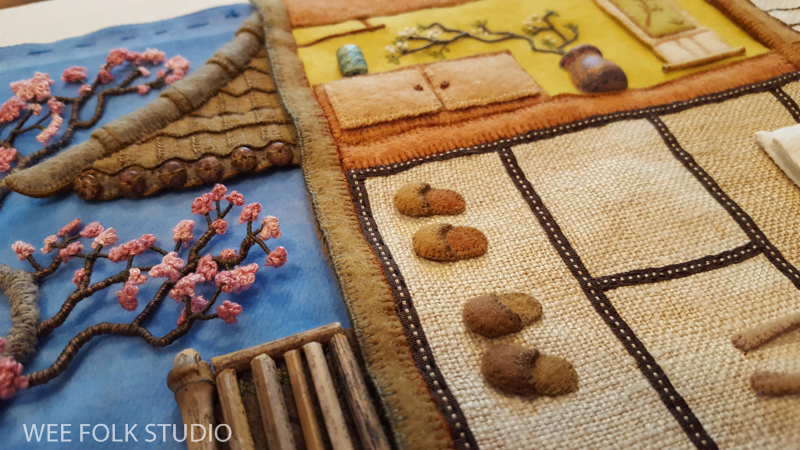 The tatami (floor mat) is made with some 75 yr. old linen fabric from my grandmother. The texture and age stains make the floor covering look woven and worn. I loved figuring out what items to display in the tokonoma (alcove). 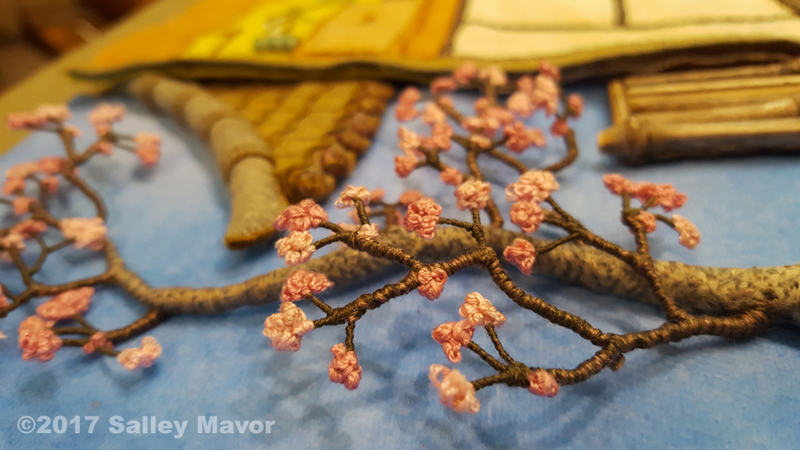 Here’s a video of stitching French knot blossoms on the ikebana (floral arrangement). and made a fence out of real bamboo shoots. 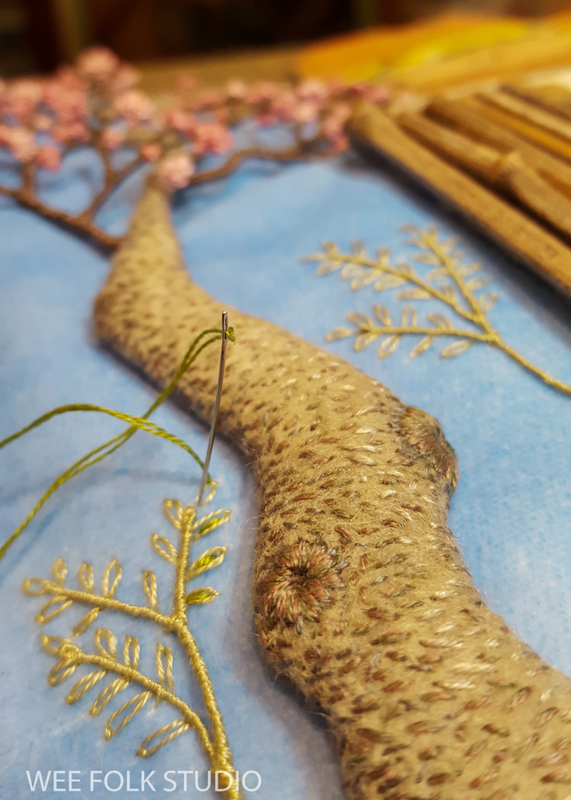 Outside, the cherry tree provided a welcome opportunity for curves and repetitious little stitches. and embellished it with chain stitching. 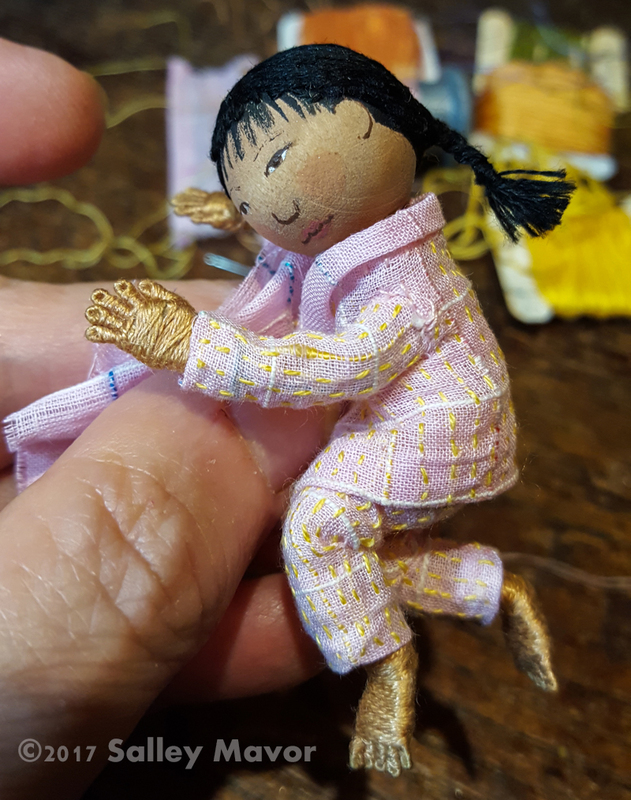 Her pajamas also got some extra yellow thread accents. The book, is written by Rebecca Bond and will be published by Houghton Mifflin Harcourt in 2020. 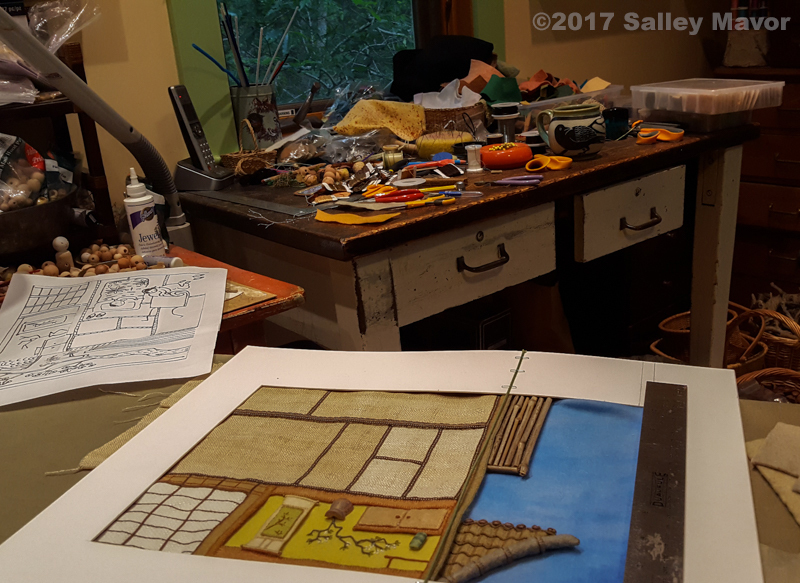 I am happy to announce that the Cahoon Museum in Cotuit, Massachusetts will host the premiere exhibit of original illustrations for the book. The exhibit will be coordinated with the book’s publication in the fall of 2020. 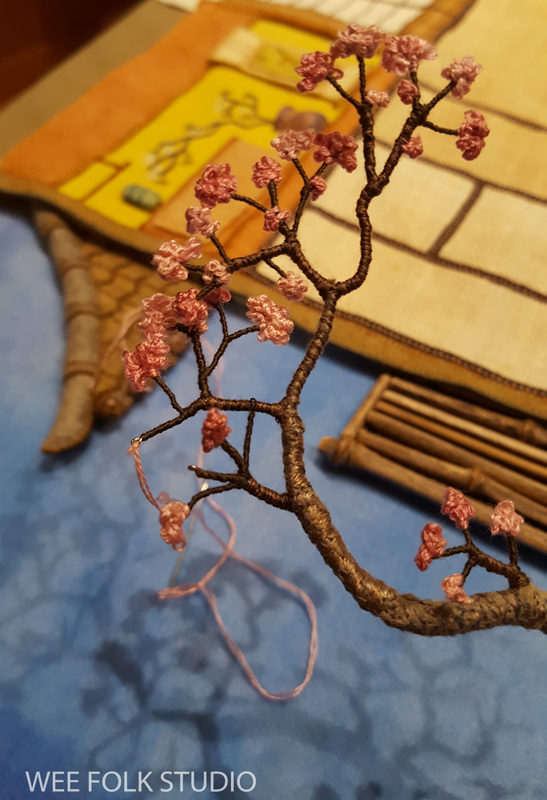 Like with Pocketful of Posies, I am scheduling a touring exhibit, so that more people can see the “real thing”, which is a totally different experience than seeing reproductions on the printed page. Interested museums and art centers are welcome to contact me for information about hosting an exhibit. It would be wonderful to have the original illustrations make their way across the whole country! To keep up with new posts, subscribe to this blog (top right column on the home page). 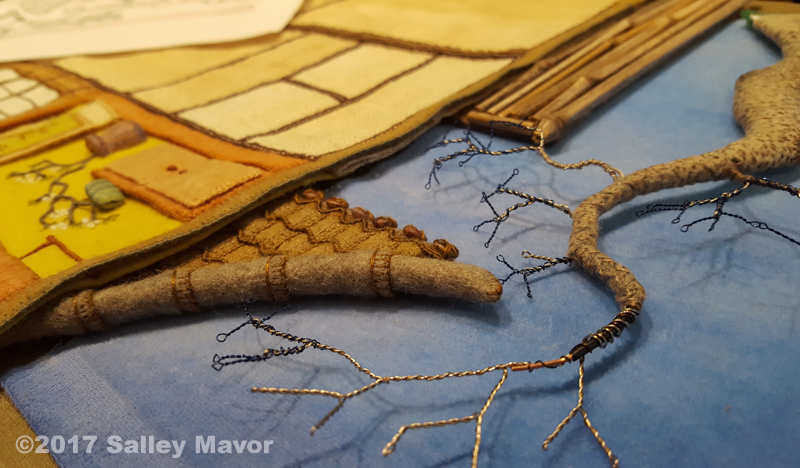 This entry was posted in Bed Book in Progress, Children's Books, Embroidery, illustration by Salley Mavor. Bookmark the permalink. I admire your talent and skill as well as your choice of topics. You are amazing. Your talent leaves me gasping. I love this! Love watching the process and progress on the book. 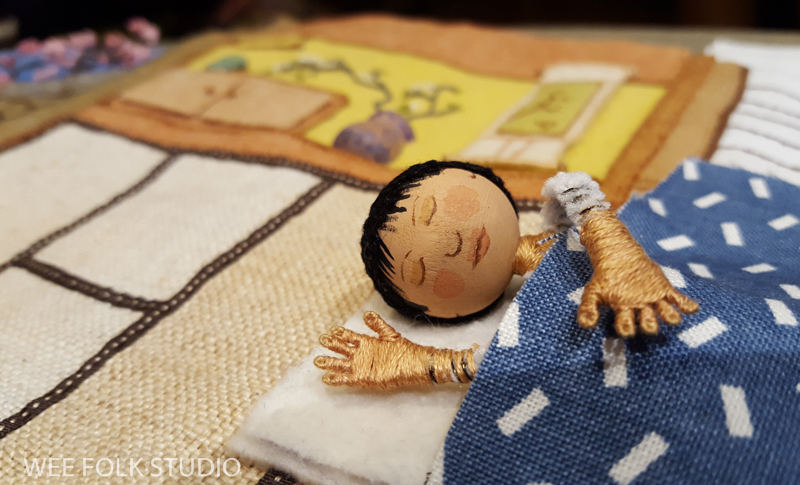 You do an amazing job of using “normal” sewing objects and turning them into authentic-looking details on something completely different! Sally, having lived in Japan for 7 years, and witnessed first hand all of your subject I can tell you you are spot on! I particularly loved the roof tiles, and the tsunami mats. Thank you Judy, it’s nice to hear from a knowledgeable source. 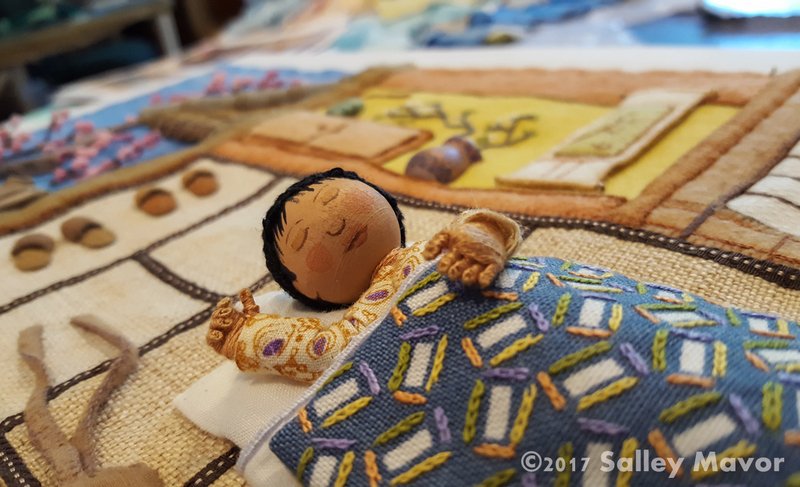 Salley, I look forward to the day that you and your sister Anne collaborate on a project…….maybe there’s a “Beds my Ancestors Slept In” book in the making? Seriously, I love following the creative process that you each follow in creating your art. Power to you both! Your work is so awesome! Thank you for sharing along the way! Thank you so much for letting us see the development of one of the pages in your upcoming book. I can not wait to see the completed project but I would love the process as much as the result if it was me. Beautiful and detailed work. I cannot wait to see the completed book. 2020 is too far away! Simply wonderful and so inspirational! Can’t wait for your book to be published! Such a legacy you are leaving your family and the world! Personally wonderful because you have helped me tell my own stories. Thank you! Thanks for sharing your amazing talent with us. So nice to see your project developing. Your art is wonderful and the topic is very special. Thank you for taking us on this journey. You do such wonderful detailed work. I loved the roof too. 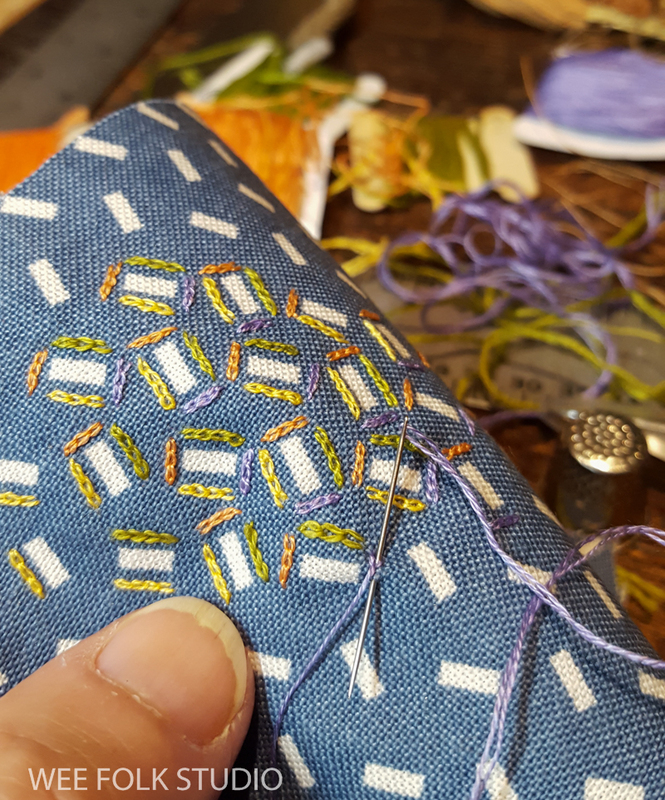 I like how you create the different pieces with simple stitches and they come out beautiful. Thank you for sharing the process of your work. Oh Sally, I can’t wait to visit your wonderful world of ‘beds’. The multi-cultural emphasis is so timely and important for everyone in this confusing world. As usual, executed beautifully, your work reflects your talent! Thank you for sharing this amazing work. I am awestruck! all your beautiful details will have a child wanting to read this book over and over just to look at the all the things they missed last time! Delightful! Thanks Anne. My hope is that the book will have something for people of all ages. What an absolutely Perfect fit for your work!!! You create such charming and beautiful work. 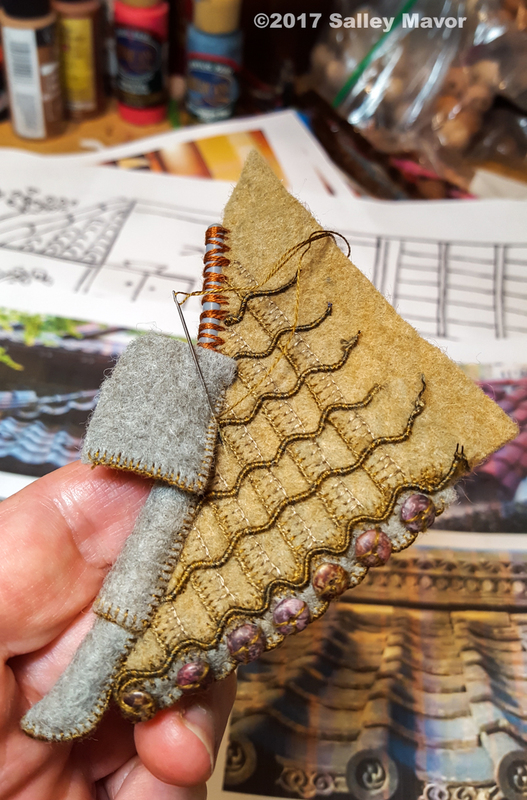 Felt and embroidery go so well together. Today I read your post about the North African camel or rather dromedary, and that you appreciated that a reader had suggested a change. I hope you don’t mind me coming with a suggestion about the Japanese scene, too. Slippers should never been worn or placed on the tatami mats. It is a no-no that children would have been spanked for in the past. If it is possible to remove the slippers or have a pair of wooden clogs on the ‘engawa’ (bamboo patio) instead, I am sure Japanese readers would find the picture nothing but perfectly adorable. By the way, I love the cherry tree! Thank you for enlightening me about the no-no of slippers on a tatami mat. Although I want to stay true to Japanese customs, I am inclined to keep the slippers as they are and endure a spanking. Let’s just call it compositional enhancement. It’s funny to find this out because the positioning of the slippers is a way to break up the sense of order in the room layout. A little rebellious streak perhaps?